It's that wonderful time of the year again where the weather it starting to warm up and the snow is melting! Spring is in the air...well at least until this Friday when we are supposed to get 12 more inches of snow! But I willl pretend Spring is coming by adding super cute new Spring outfits from Little Me to my son's wardrobe! 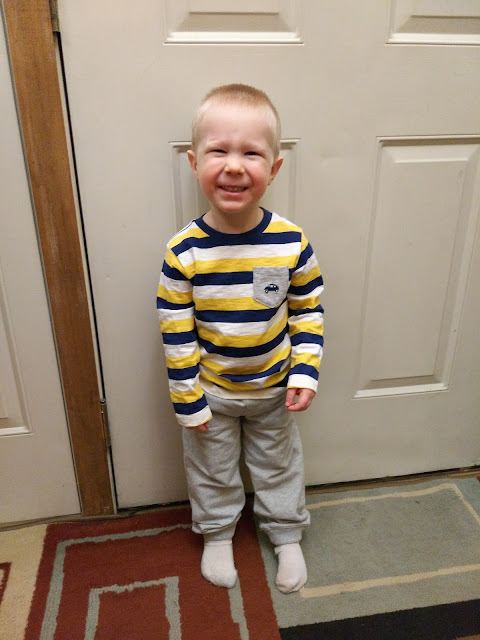 These super cute new clothes from the Spring line put a smile on my face and makes it feel like Spring in our house! I love that the Little Me Spring '17 line is super cute and versatile for the start of warmer Spring weather, while still remembering the brisk times that happen too. The classic cars punch up a comfy set of play clothes designed with room to vroom and so much more. This baby boys' collection includes a long-sleeve pocket shirt, graphic tee and slip-on pants. This outfit is so comfy and cute and my son LOVES cars and vehicles so this was a must in his wardrobe! It is so versatile by including a short and long sleeve shirt for both cooler and warmer temps! A pin-dot bow tie puts the finishing touch on this nautical collection made for your dapper little man, featuring a collared button-down shirt and woven pants with an elasticated back for an easy fit. This outfit just made my heart happy the minute I saw it and put a big smile on my face! It is SO adorable and I love the yellow shirt for Spring! The bow tie just sends it over the edge of absolute cuteness and it is great for Easter, weddings, church and so much more this Spring! You can purchase all Little Me Spring collection items from their website.